In the semi-final held today, India won Maldives with the score of 1-0. India won the game by the goal placed by Arnab Mondal at the 85th minute of the game. It’s the second semi-final match which took place at the Dashrath Rangshala Stadium in Nepal. So coming Wednesday there is great entertainment waiting. We are going to watch the grand finals of South Asian Football Federation Championship. Afghanistan is going to face India in finals. Afghanistan is the first team qualified to final yesterday after beating Nepal with the score of 1-0. Considering two teams of today’s semi-final, Maldives had been undefeated and topped Grouped B with two wins and a draw before today’s match. Arnab Mondal, an young player marked his first International Goal today and made Defending Champions India to win the match against Maldives. It’s the ninth time India getting into the finals and fifth successive time getting into the finals of SAFF championship. The first half of the match went without any goals from both the sides. Reports says that Mondal looked very nervous throughout the match but the nervousness ended up in the better way in favor of India. The 85th minute turned to be lucky for India when Mehtab Hossain’s corner kick was headed by Syed Rahim and carried to Mondal, who made the delightful strike and made his first International goal. This goal made India to top the score board with 1-0. Look the goal placed by Indian team. At the final moments, Maldives players reacted in different way and many bad moments took place. Maldives Player Ali Umar was given red-card for attacking referee Idham Mohammed. Another thing is, One of the organizer was attacked by group of Maldives players. Then police were called to tackle this situation which looked to be out of control. Finally India won the Semi-finals against Maldives and made their mark in Finals for the ninth time. 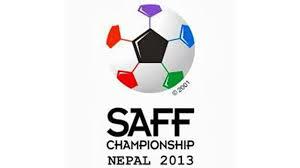 Lets wait for the final moments of SAFF on Wednesday where India is facing Afghanistan.